The print and packaging job market has always been a competitive environment. Not only are we competing with other applicants for a role, we are also competing for attention. 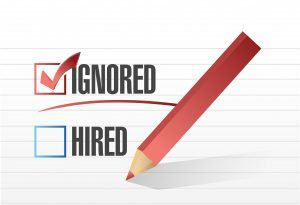 Employers (and recruiters) seek candidates focused on their career, not someone merely going through the motions of looking for another job. Here are the simple mistakes holding you back, and straightforward feedback as to why your CV isn’t commanding interviews. Finding a job is a serious business. Often we start too small and stay there, then wonder why the phone isn’t ringing. By ‘small’ we mean unfocused. Little things give you away. Phrases such as “I’m putting feelers out”, casual coffee chats with industry contacts “to see what’s out there”, or sending out your CV to “see what happens”. This casual tone leaks into your CV and covering letter. Would you hire a distracted manager to run one of your talented teams? There’s a reason we call the process job ‘hunting’. The search for your next role requires focused commitment and an investment of your time. To modify the famous RAF quote: time spent in consideration is seldom wasted. Especially when it comes to finding the role you want. You’re an experienced, talented, multi skilled candidate with so much to offer your target company in the print and packaging industry. Never underestimate the power of asking someone you trust to read your CV. They don’t need to have industry experience – in fact their lack of experience will be the key to unlocking your CV. Ask them to answer the following: does your CV makes sense (grammar), is it easy to read (layout) and – crucially – does it sound like you (tone). Listen to what they have to say. Remember: what’s obvious to you isn’t necessarily obvious to others. Your experience is your expertise; this is an opportunity to share your knowledge. Clarity and brevity are essential. Keep an open mind when receiving feedback and make the necessary changes. There’s no excuse for careless grammar, a disengaged tone or formatting errors at this stage of your career. Everyone knows they need to tailor their CV and covering letter for each job applied for. This should be your signal to go the extra mile and separate yourself from the competition. Take a step back and look at how your existing skills align with the job you want. Consider how to frame your skills in relation to your experience and the role. Look at what you are saying. What do your words communicate about you, your experience and professional goals? How are your skills a good marriage with the job? Include statistics to back up business improvement claims made in your CV, such as performance and sales. Qualify your claims – make it easy for the person reading your CV to see that you can do the job. Mention skills you want to develop. You are a manager keen to continue learning as technology evolves. Make yourself relevant now and into the future. Ultimately, if you don’t capture why your skills, experience, management style and vision are what a company is looking for, who will?